The series of one-showpiece exhibitions is an other way to present the extensive collection of the Kaliningrad Regional Amber Museum, which includes around 16 000 depositary items. This way of demonstrating an art piece allows specialists, its author and guests to look at it out of the context of a themed exhibition. Casket with a lid. Faceted bead necklace. 1st half of the 20th century. Amber, metal, thread; turning, cutting. 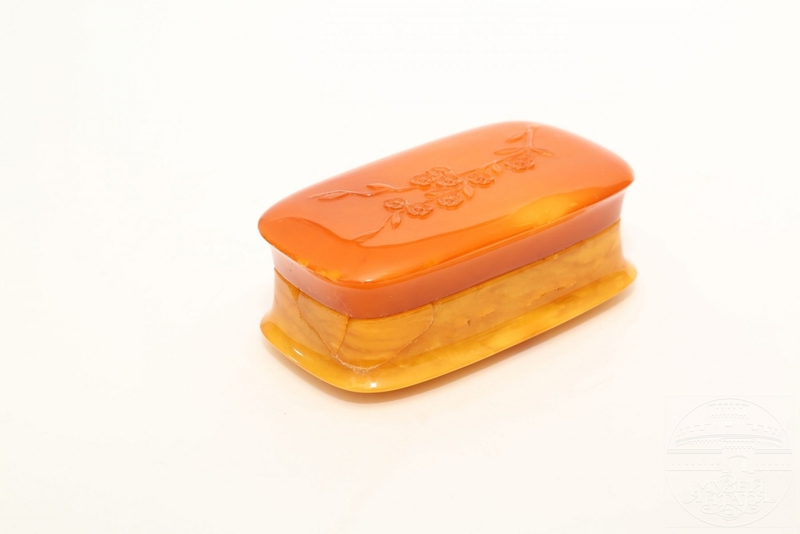 The casket with the lid is made from natural amber: the lid – from orange amber, body of the casket – from yellow amber with white inclusions. There is a carved decoration in the shape of a twig of flowers on the lid. The work was made in the first half of the 20th century at one of the private productions in Königsberg in East Prussia, it is an example of souvenir production with amber. Along with the biggest enterprise producing amber State Amber Manufactory in Königsberg, there were several private producers: the biggest among private firms the North German amber industry firm Naujoks, Mann & Gedenk, firms of Adolf Lehmann, J.Ottmüller, Bernhard Liedke, Hartmann, and others. Amber, both natural, and pressed, was purchased by this private manufactories at the State Amber Enterprises in Königsberg, whose division was the amber manufactory. 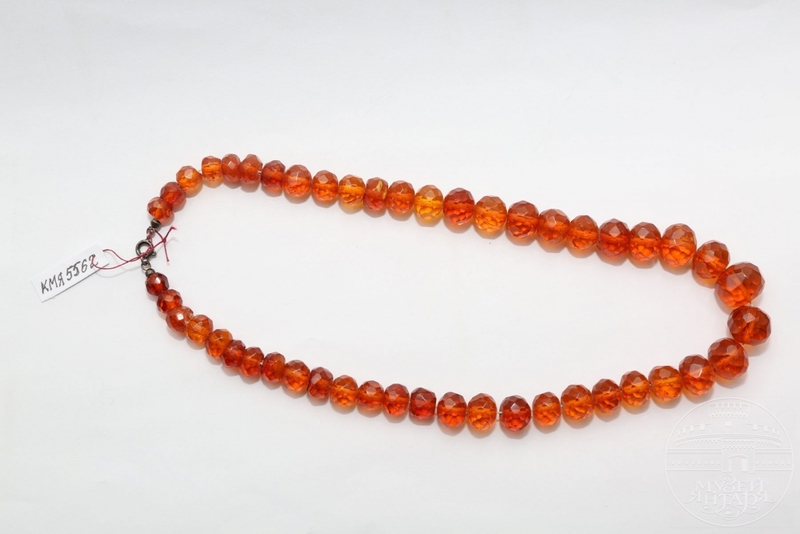 The bead necklace are made of natural amber. Such bead necklaces were produced at the State Amber Manufactory in Königsberg in mass-series, beads had various forms though – ones of round and oblong olives. Every bead was cut manually and by sight. Number of facets, placed by mathematical scheme, was up to several hundreds. This kind of cutting was called Königsberg slide. The enterprises of the world renown, the State Amber Manufactory, was established in Königsberg in 1926 and existed until the end of the Second World War. As a company dealing with working of amber and production of amber items, it was and is still considered the largest amber manufactory in the world. Works made at the manufactory are distinguished by the high quality of execution and artistic level of the mastery. Period of the 1930-40s is known to be the second Golden Age of the amber art.